Jesus’ presence always brought astonishing peace to me no matter how bad the situation I was in. Whenever I was in a prison, he was always there for me. He transformed the jail into a heaven and the burdens became blessings. There are many Christians who do not feel His glorious presence as as something real, because for them Jesus only occurs in their minds and not in their hearts. Only when someone surrenders his heart to Jesus can he find Him. 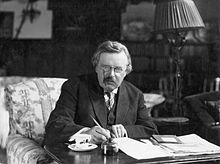 Video pits Chesterton against Nietzsche in dramatic portrayal & accounts for the destructiveness of Nietzsche’s philosophy. G. K. Chesterton introducing Aesop’s fables in a powerful way.